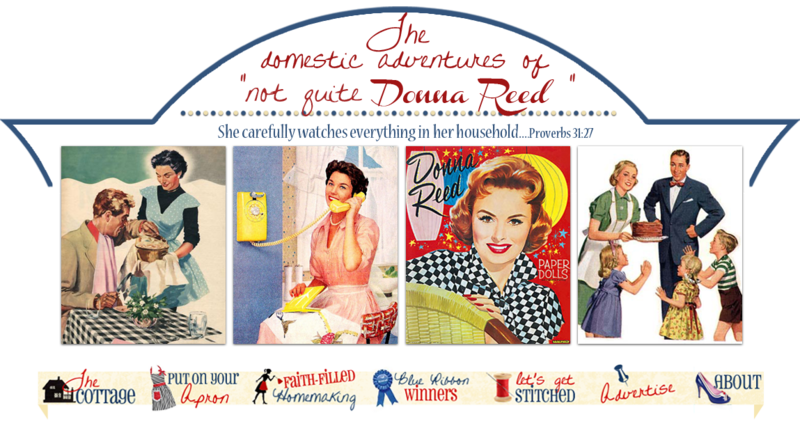 Not Quite Donna Reed: GETTING ALL DOLLED UP! I was shopping in a certain store the other day and really noticed the state of dress or undress, as the case may be, of today's ladies. Please , someone tell me that going out in pajama pants is not acceptable! I have to say that never, have I been so assaulted with the ugliness of people's clothing choices as I had been that day. Grown women (some quite large) in tiny tanks with tweety bird sweats, flip flops, hair thrown in a messy bun, and an assortment of tatooes on every body part assaulted my senses! What is going on with women these days? Is it a lack of self-respect, caring, money, dignity? I truly would love to know---please someone enlighten me! Not only are women and youth dressing like a bunch of slobs (quite frankly, they look dirty to me), but they are dressing SO immodestly. Not much is left to the imagination. Now, I am not so old-fashioned or prudish to begrudge the latest fashions, some are quite cute. I love cute! I love classy! With all that said, back in the day when I met my husband I fully admit to dressing a lot more immodest. You know, tight jeans, half shirts, etc. At work I wore very tailored dresses and suits, but my wardrobe for casual was more the latest trend. Immodest clothes have been around a loooong time;-) The Lord convicted me of immodest dressing years ago. Yet, now, the trend seems to be more sloppy, even more revealing. In raising daughters I want to convey the importance of cleanliness and dignity. Now, I am not talking frumpy either. One thing my husband has asked me never, ever to wear is a jumper. Hates them! I do too. They look cute on little girls , but a jumper on a grown woman looks frumpy to me. Just my opinion here. I tend to prefer denim skirts or skirts with a bit of twirl. I also like tie dye fashions, hemp and linen being a favorite material. Maybe I could consider my look more earthy, natural. 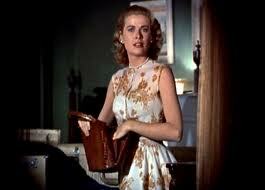 A favorite movie of mine is Rear Window, with Grace Kelly. 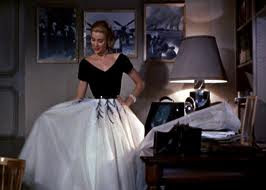 If anyone exuded class in dress she did! This dress above is stunning, isn't it? I wish they would make 'em like this again! This suit is just beautiful, classy. White gloves, pearls, and a killer charm bracelet. 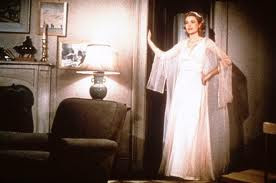 This is a nightgown! They do still make them this way, but you have to look. Why do married women get into bed with shorts and t-shirts? Isn't the above a bit more alluring. Sorry, but alluring in the bedroom is still a better bet than tweety bird on your jammies. Casual can look beautiful, too. My Mum called them clam diggers, today they are capris. 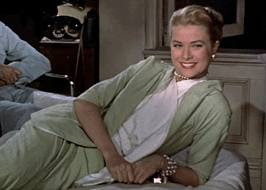 Even Grace knew casual could be cute and classy. Even everyday attire was pretty. Don't we women wish for pretty in our clothing. Now, I know there are days where it is hard to get a shower in with little ones to care for, but I did, and do, always try to get dolled up for the day. I feel better about myself. One carries oneself very differently when they feel and look good, even in the home. If a homemaker had an outside the home job she probably wouldn't leave the house for work in jammies, so why stay in them all day. Our work in the home is more important than any outside job we will ever undertake, let's dress the part. Let's be cute and classy at home. Not only will we feel better, our husbands will appreciate it too. Sadly, the days of women knowing how to handle needle and thread are gone, but the Proverbs 31 woman did wear beautiful clothing. In her day and a woman of her means, silk and linen would be her materials. We don't have to be able to afford the most expensive, yet we can have neat and clean, modest and pretty. If you have been living in sweats try getting dolled up during the day. Put on a pretty outfit, fix your hair, dab a bit of make-up on . Buy a new purse or shoes, even thrift stores are a good deal for those. Just treat yourself to lookin' pretty! We are ambassadors for Christ and the noble job of motherhood--dress the part! My sentiments exactly. I was born in 53, so I am old enough to remember when people dressed up for all sorts of things. I really miss it. It was good for everybody's morale and easy on the eyes. I agree. I think it is the demise of society on the whole. On an individual level, I think it is sloth, in varying degrees. I know for myself, it is a conscious effort to forgo being cozy and dress appropriately, especially for church, in dresses/skirts. There is not need to see my back end...I wish older women especially would set an example to the young. As for the immodesty, I think it is lack of virtue. I was brought up to be very modest, so as not to tempt boys. I feel for those today who are not; they need to be taught. I think the Duggar family is such a wonderful example on t.v. in this matter. My husband extracted the same promise about jumpers, which was fine since they do nothing to flatter my, er, ampleness. Your post is uncanny in its timing, though. Just last night we were talking about how girls these days, and even some older women, seem to have lost the distinction between clothing one wears at home (PJ pants, tank tops, etc.) and clothing one wears out of the house where it reflects on one's husband, the state of one's marriage, and one's children. I was HORRIFIED yesterday at the mall when I saw a woman in her mid-20s wearing 4-inch strappy wedge sandals, short shorts and a camisole that clearly had no built-in support... while she was pushing a stroller with a newborn with two toddlers in tow! I'm of the mind that if a woman accompanied by children shouldn't look as if she's trying to "drum up business", if you know what I mean. I haven't hear that expression in awhile--thanks for the chuckle...LOL! I have often brought up this same point. And now where I live women are wearing mens haircuts, it is all the rage. Ewwww! There are ways to look beautiful maybe not like a movie star, but feminine and pretty. Thanks for sharing your thoughts. Yes! Why do we choose to be ugly and ill-kempt? I was at a clothing store the other day. Most of the goods were bads! Recently I've been enjoying sewing more. Part of my new found enthusiasm came from being accosted by ugliness. We have a sweet older lady at church who always looks so very nice. She isn't flashy or extravagant, just lovely. I want to be like her. HI, I agree. I am so tired of trying to look the other way. I often wonder how these women feel about themselves.I remember the "old days" when everyone fixed-up before running errands. Amen, Suzanne! It does a great deal of honour to our husbands - and to ourselves, our children, our parents - to be nicely turned out. Dressing well and being groomed also shows respect for people around us. Dressing sloppily is a way of thumbing our noses at each other. "You aren't worth the trouble. And I don't care what you think". It comes from a culture of entitlement. For me, the first step is teaching my children to have respect for themselves and for others. Courtesy, good manners both lead to modesty of thought, word, deed, and dress.